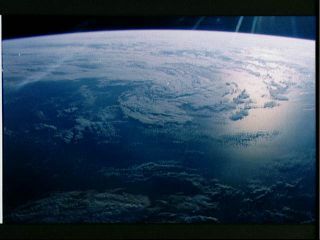 Earth's clouds as seen from the space shuttle. Clouds cluster over vegetative landforms and along ocean currents, reflecting light from the sun into space. Two astronomers from Spain are trying to determine how brightly Earth shone during the age of the dinosaurs. Their results not only reveal how Earth would look to a distant observer, but could also help astronomers determine the layout of landforms on faraway planets. Rather than relying on climate models, the pair analyzed the relationship between cloud cover and landforms to calculate how clouds would gather over different regions. "When you look at the planet...it has a given distribution of continents and clouds," said Enric Palle, of the Astrophysical Institute of the Canary Islands (IAC). "But it has not always been the same." With the relationship in hand, they looked back in time to measure how much the brightness of the planet would vary as the continents of Earth shifted 90, 230, 340, and 500 million years ago, when the planet had a different layout. The Earth's continents 85 million years ago. The different continental distribution would have influenced cloud cover. Palle and lead author Esther Sanroma, also of the IAC, used 23 years worth of data on the global distribution of clouds over various landforms from the International Satellite Cloud Climatology Project. Detailed landform models from paleogeologist Ron Blakely provided them with a layout of the Earth over four different time periods. They wanted to look farther back, but the atmosphere has only had a similar temperature and composition for the last half billion years. They found that for much of Earth's history, the daily variations were minimal. Such small shifts would be a challenge to measure from a distance. Saturn's moon, Titan, is thought to boast clouds that rain methane down onto its surface, as well as a methane ocean. Astronomers studying the cloud cover over other planets could measure the changes in brightness to determine the layout of land beneath. However, 500 million years ago, there were huge swings in the light as the planet rotated each day. The variations were four times as large as changes in other periods. The authors attribute this to two causes. First, the land masses were closer together, rather than spread out, leaving wider expanses of oceans. These result in a wildly different cloud distribution. Second, the land half a billion years ago was all desert, completely bare of all life. "Five hundred million years ago is the time in which life evolved from oceans to land," Palle said. As plants began to cover the land, the cloud arrangement shifted. Deserts have few clouds, because there is very little water vapor in the air. Thus, the advent of life brought changes that would have made Earth more difficult to examine from space. "We camouflaged ourselves, and made it more difficult for a distant observer to characterize the Earth," Palle said. The process could work in reverse - a light curve with small changes could potentially indicate vegetation on another planet. In December 2011, astronomers announced the discovery of Kepler-22b, the first planet in the habitable zone of a sun-like star. Though its gas envelope raises the temperature too high for liquid water on the surface, other rocky planets within similar distances from their star could potentially boast water and clouds. Of course, astronomers studying an exoplanet would need more information before they could definitively reach such a conclusion. Watching your local weather, it might seem as though the movement and behavior of clouds are random, but in fact they are not. Wider trends emerge when you look at the planet on a global scale. "There are some spots on Earth that are always cloudy, like over the Amazon rainforest, and there's other spots like the Sahara desert which are always clear," said planetary scientist Sara Seager, of the Massachusetts Institute of Technology. Seager, who was not involved in this research, models the atmospheres of exoplanets. Rather than relying on climate modeling to predict how clouds would behave, Palle and Sanroma decided to take advantage of these trends. Their model assumes that such patterns would continue in the past, with clouds behaving the same way over oceans and deserts as they do today. "Big cloud patterns, on a global scale, are tied to the continental distribution and ocean circulation," Palle said. By applying this pattern to other time frames, they were able to calculate how widely the brightness of Earth would change over the course of its daily rotation. "This is a different way of looking at the problem," Seager said. According to Palle, a new approach was necessary to look so far back in time. He points out that we have about 30 global models predicting the cloud formation in a hundred years in the future. Though they agree that the temperature will change in response to an increase in carbon dioxide, they provide a range of responses to how the clouds will react - and no one knows which one might be correct. By focusing on the patterns of clouds over land and ocean, Sanroma and Palle hope to overcome the uncertainties that crop up in climate modeling. So how long before we can identify the continents of distant planets? "It might be feasible with the next generation of space telescopes," Palle said. At the present, nothing is planned that would be able to detect such variations, but perhaps in the near future. "The TPF (Terrestrial Planet Finder) would have been able to take this kind of observations for a close planet," he said. NASA's Terrestrial Planet Finder, or TPF, had a proposed goal of studying all aspects of exoplanets, but, after being proposed several times, it was canceled in 2011. "We hope that our TPF concept will be resurrected and will launch sometime in the future," Seager said. As astronomers study extrasolar planets, they can determine much of its composition from the changes in brightness. Rocky planets with no atmosphere, icy planets, and planets with permanent cloud cover would all have almost no variations. But, according to Palle, "if it has an atmosphere with broken clouds, we will see it in variability." The scattered cloud cover would imply oceans on the surface, which could be potential habitats for the development of life. The type of liquid would depend on how close the planet lay to its sun. "If it has water clouds, it has water oceans," Seager said. "Any water raining down will eventually create an ocean. Maybe smaller than we have on Earth, but still, an ocean."